HONNE and Kodaline will performing in Kuala Lumpur next year. Good Vibes Festival, organiser of the titular music festival, which is one of the biggest music festivals in Malaysia, will be hosting the show as part of its 'Good Vibes Presents', series, which saw the likes of artists such as LANY and Echosmith perform before. At next year's series, British electro-R&B duo, HONNE, and Irish rock band, Kodaline, will be playing two back-to-back shows over the weekend in March 2019. Don't miss your chance to catch two of these highly acclaimed acts! With the announcement of these two shows, Good Vibes Festival 2019 is looking to be a spectacular edition. Good Vibes Festival presents HONNE will be happening on Saturday, 2 March 2019, at KL Live. Tickets will go on sale here on 13 December 2018. 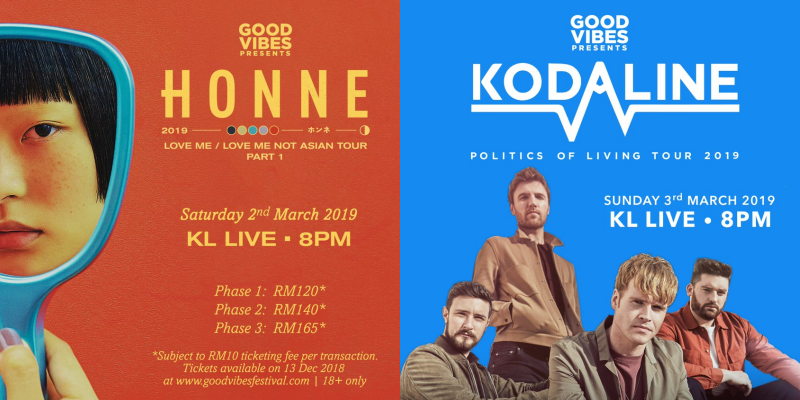 Good Vibes Festival presents Kodaline is set on Sunday, 3 March 2019, at KL Live. Get your tickets here from 12 December 2018 onwards.